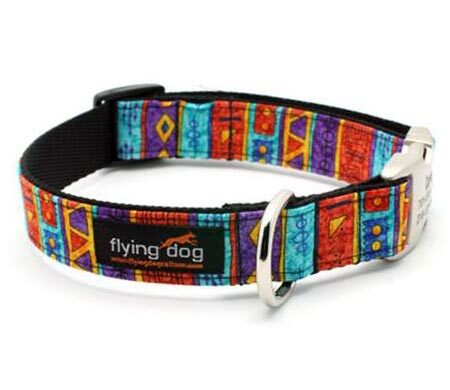 Personalized dog collar and leash, by Flying Dog Collars. with personalized buckle. Multicolor design, Mexican, Maya Colors. 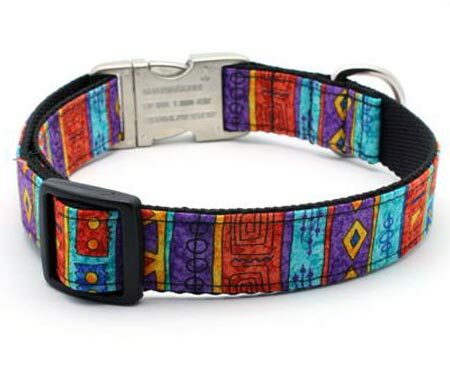 Colors: multi-colored pattern, inspired by Mexican designs and Carlos Santana. Purple, cyan bright blue, red, golden yellow; Black webbing. 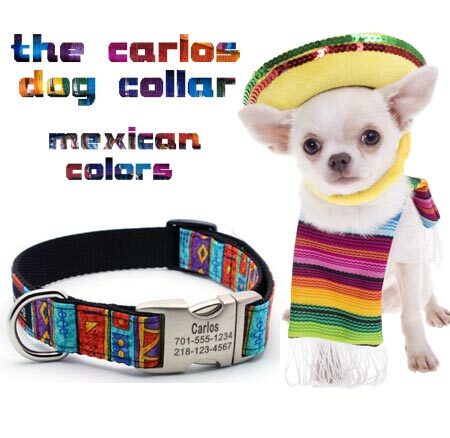 The Carlos Designer Dog Collar and matching lead inspired by Carlos Santana will definitely strike a "chord" with you. Distinctive colors and patterns, inspired by Mexican designs. for tiny and extra small dogs, for toy dogs, for small dogs, for medium dogs, for big dogs, and for giant extra large dog breeds...! 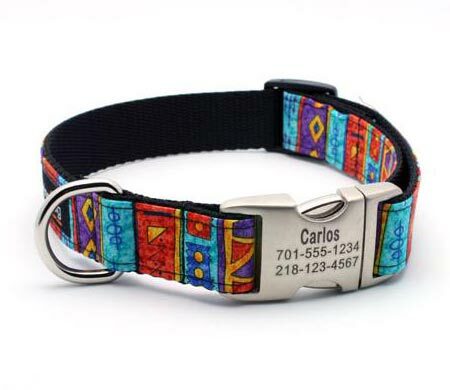 Multi colored dog collar, inspired by Mexican designs and Carlos Santana. Handmade designer dog collar with custom engraved buckle to personalize it with your dog's name and other ID text. From Extra Small 8 inch up to Extra Large 28 inch neck. For extra small dogs, small, medium, large and extra large dogs, up to neck size 28 inches! 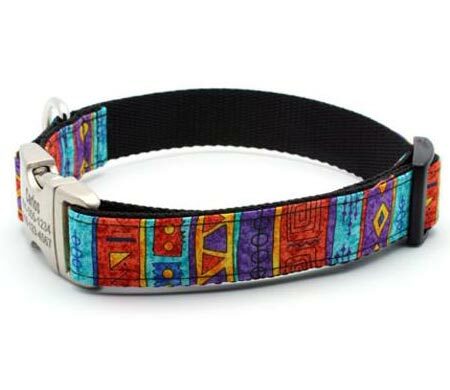 Designer dog collars and leashes, personalized dog collars and leads. Personalised dog collars, Many Colours. XS Extra Small collars for dogs, Small dog collar (S, XS), Medium dog collar (M), large dog collar (L), extra large dog collar (xlarge, xl, xxl). Available Neck Sizes in inches: 8 inch, 9 inch, 10 inch, 11 inch, 12 inch, 13 inch, 14 inch, 15 inch, 16 inch, 17 inch, 18 inch, 19 inch, 20 inch, 21 inch, 22 inch, 23 inch, 24 inch, 25 inch, 26 inch, 27 inch, and 28 inch.